Do these dogs look familiar? If you think you recognise these gorgeous Labs, then you're right - you do! 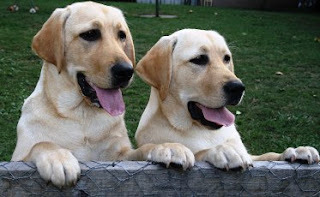 These two Labradors, once puppies, are featured on the cover of the current January/February 2008 issue of Dogs Life. Heather and Kate Brook from Mistyoak Labs visited the Dogs Life studio several months ago with three beautiful Labradors - Chloe, Jazz and Holly. Now Chloe and Jazz (the two cover pups) are all grown up! We're thrilled to see how much the pups have grown. They are six months old today. Photo taken by Kate Brook.